The Osage County Fair Association has released the results of the livestock shows held during the fair, June 28-July 1, 2017. Participants’ ribbon placing and 4-H club affiliation are listed as initials, with a key at the end. Senior Division: Grand champion, Tracy Wilk, WW, sheep division; reserve grand champion, Bonnie Young, NO, horse division; Morgan Woodbury, beef division; Madison Smitha, VBR, swine division; Ainsley Corwine, NO, goat division; Royce Cowan, WW, dairy division. Intermediate Division: Grand champion, Akaylee Prunty, WW, sheep division; reserve grand champion, Grace Croucher, WW, beef division; Garrett Croucher, WW, goat division; Kinsley Garrison, NO, swine division. Halter: 3 years old and older stock type geldings: Katie Lowry, BG, P.
Halter: 3 years old and older stock type mares: Lynnea Nelson, NO, P; Bonnie Young, NO, B.
Halter: Ponies and mini all ages, mares and geldings: Bonnie Young, NO, R.
Senior showmanship: Bonnie Young, NO, P.
Intermediate showmanship: Lynnea Nelson, NO, B. 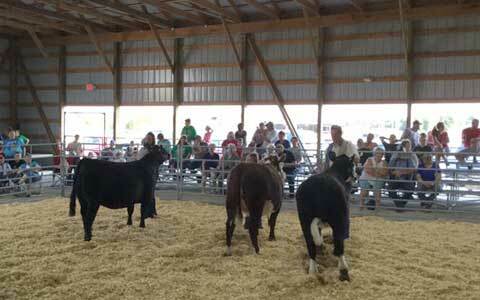 Junior showmanship: Katie Lowry, BG, P.
In hand trail, all ages: Bonnie Young, NO, P; Lynnea Nelson, NO, B. Western pleasure, seniors: Bonnie Young, NO, R.
Western pleasure, juniors: Katie Lowry, BG, B.
Horsemanship, senior: Bonnie Young, NO, R.
Flag Race, seniors: Bonnie Young, NO, P.
Flag Race, juniors: Katie Lowry, BG, P.
Barrels, seniors: Bonnie Young, NO, P.
Barrels, juniors: Katie Lowry, BG, P.
Poles bending, seniors: Bonnie Young, NO, R.
Poles bending, juniors: Katie Lowry, BG, P.
Open class, junior doe: Kimberly Knauber, solid mini Rex, B; Kimberly Knauber, broken mini Rex, B. Grand champion breeding ewe: Akaylee Prunty, WW; reserve grand champion breeding ewe: Kilene Tate, WW. Breeding sheep, Hampshire ewe lambs: Kilene Tate, WW, B, class champ; Chloe Cannon, NO, B, class reserve champ. Breeding sheep, crossbreed ewe lambs: Akaylee Prunty, WW, B, class champ. Breeding sheep, crossbreed aged ewes: Tracy Wilk, WW, B, class reserve champ. Senior sheep showmanship: Tracy Wilk, WW, champion; Kilene Tate, reserve champion. Intermediate sheep showmanship: Akaylee Prunty, WW, champion; Addyson Easter, LL, reserve champion. Junior sheep showmanship: Chloe Cannon, NO, champion. Grand champion market lamb: Akaylee Prunty, WW; reserve grand champion Market Lamb: Kilene Tate, WW. Hampshire market lambs: Akaylee Prunty, WW, B, class champion; Tracy Wilk, WW, B, reserve class champion; Addyson Easter, VBR, B. Cross market lambs: Kilene Tate, WW, class champion; Chloe Cannon, NO, B, class reserve champion; Addyson Easter, VBR, B; Kilene Tate, WW, B; Tracy Wilk, WW, B; Tracy Wilk, WW, B. Grand champion breeding meat goat: Garrett Croucher, WW. Reserve grand champion breeding meat goat, Savannah Davis, VBR. Boer breeding meat goats, doe kids, 4-6 months: Savannah Davis, VBR, B, class reserve champion. Boer breeding meat goats, yearling does 12-24 months: Garrett Croucher, WW, B class champion. Pygmy breeding meat goats, doe kids, 4-6 months: Cody Atchison, BG, B, class champion. Pygmy breeding meat goats, 2-year-old does: Cody Atchison, BG, B, class reserve champion. Senior goat showmanship: Ainsley Corwine, NO, champion; Gabe Butel, NO, reserve champion; Cody Atchison, BG, B; Nathan Fleming, NO, B. Intermediate goat showmanship: Garrett Croucher, WW, champion; Kolysn Bergkamp, VBR, reserve champion; Kyler Bergkamp, VBR, B; Tyler Richmond, NO, B. Junior goat showmanship: Savannah Davis, VBR, champion. Brig Corwine, NO, reserve champion. Grand champion market meat goat: Ainsley Corwine, NO. Reserve grand champion market meat goat: Brig Corwine, NO. Market meat goats over 50 pounds: Gabe Butel, NO, B; Nathan Fleming, NO, B; Garrett Croucher, WW, B; Kolysn Bergkamp, VBR, B; Kyler Bergkamp, VBR, B; Ainsley Corwine, NO, B; Brig Corwine, NO, B; Brig Corwine, NO, B; Cody Atchison, BG, B; Cody Atchison, BG, B; Tyler Richmond, NO, B; Ainsley Corwine, NO, B; Tyler Richmond, NO, B; Savannah Davis, VBR, B. Grand champion breeding swine: Kinsley Garrison, NO. Reserve grand champion breeding swine: Mariah Smitha, VBR. Breeding swine, Duroc: Jaiton Bosse, WW, class champion; Grace Croucher, WW, reserve class champion; Keegan Anschutz, VBR, B. Breeding swine, spot: Wyatt Stinebaugh, NO, B, class champion; Madison Smitha, VBR, reserve class champion; Garret Stinebaugh, NO, B; Jake Stinebaugh, NO, B. Breeding swine, Yorkshire: Kinsley Garrison, NO, B, class champion. Breeding swine, all other breeds: John Sand, NO, B, class champion; Nadia Williams, WW, B, class reserve champion; Katie Lowry, BG, B. Breeding swine, crossbred: Mariah Smitha, VBR, B, class champion; Madison Smitha, B, reserve class champion; Wyatt Stinebaugh, NO,B; Kylar Anschutz, VBR, B; Kayden Bergkamp, VBR, B; Makenzie Smitha, VBR, B; Mariah Smitha, VBR, B; Garrett Stinebaugh, NO, B. Senior swine showmanship: Madison Smitha, VBR, champion; Keagan Anschutz, VBR, reserve class champion. Intermediate swine showmanship: Kinsley Garrison, NO, champion; Mariah Smitha, VBR, reserve champion; Garrett Croucher, WW, B; Ryan Addleman, VBR, B; Kyler Anschutz, VBR, B; Grace Croucher, WW, B; Jenna Hamilton, WW, B; Kayden Bergkamp, VBR, B; Ethan Kneisler, LL, B; Garrett Stinebaugh, NO, B; Nadia Williams, NO, B; Alexis Barrett, WW, B; Akaylee Prunty, WW, B; Kolysn Bergkamp, VBR, B; Kyler Bergkamp, VBR, B; Josie Thompson, WW, B. Junior swine showmanship: Makenzie Smitha, VBR, champion; Wyatt Stinebaugh, NO, reserve champion; Chloe Cannon, NO, B; Carson Horne, VBR, B; Brody Thompson, WW, B; Brig Corwine, NO, B; Cole Thompson, WW, B; Braelyn McNally, MJH, B; John Sand, NO, B; Jacob Stinebaugh, NO, B; Jaiton Bosse, WW, B; Allie Kneisler, LL, B; Katy Lowry, BG, B. Grand champion market swine: Kinsley Garrison, NO. Reserve grand champion market swine: Ryan Addleman, VBR. Duroc market hogs: Ryan Addleman, VBR B, class champion; Kinsley Garrison, NO, B, reserve class champion; Jaiton Bosse, WW, B; Ethan Kneisler, LL, B; Braelyn McNally, MJH, B; Chloe Cannon, NO, R; Garrett Croucher, WW, R.
Spot market hogs: Jenna Hamilton, WW, B, class champion; Jacob Stinebaugh, NO, B, reserve class champion; Wyatt Stinebaugh, NO, B; Garrett Stinebaugh, NO, B; Alexis Barrett, WW, B; Allie Kneisler, LL, R.
Yorkshire market hogs: Kinsley Garrison, NO, B, class champion; Wyatt Stinebaugh, NO, B, reserve class champion; Kylar Anschutz, VBR, B; Jacob Stinebaugh, NO, B; Garrett Stinebaugh, NO, B. All other breeds market hogs: Mariah Smitha, VBR, B, class champion; Madison Smitha, VBR, B, reserve class champion; Makenzie Smitha, VBR, B; Nadia Williams, WW, R.
Cross market hogs: Kinsley Garrison, NO, class champion; Madison Smitha, VBR, reserve class champion; Kayden Bergkamp, VBR, R; Kyler Bergkamp, VBR, R; Akaylee Prunty, WW, B; John Sand, NO, B; Brig Corwine, NO, B; Garrett Croucher, WW, B; Brody Thompson, WW, B; Braelyn McNally, MJH, B; Kolyson Bergkamp, VBR, B; Kyler Anschutz, VBR, B; Josie Thompson, WW, B; Grace Croucher, WW, B; Cole Thompson, WW, B; Ryan Addleman, VBR, B; Jaiton Boxxee, WW, B; Akaylee Prunty, WW, B; Makenzie Smitha, VBR, B; Keegan Anschutz, VBR, B; Brody Thompson, WW, R; Madison Smitha, VBR, B; Carson Horne, VBR, B; Cole Thompson, WW, B, Keegan Anschutz, VBR, B; Kilene Tate, WW, R.
Open class, spot breeding gilt: Gradey McNally, champion. Open class market hog: Kaiden Bosse, champion; Kayden Barrett, champion. Senior bucket calf (4-Hers age 10 -12 years): Gracy Smith, WW, grand champion; Cole Thompson, WW, reserve champion. Junior bucket calf (4-Hers age 7 -9 years): Brig Corwine, NO, grand champion; Katy Lowry. 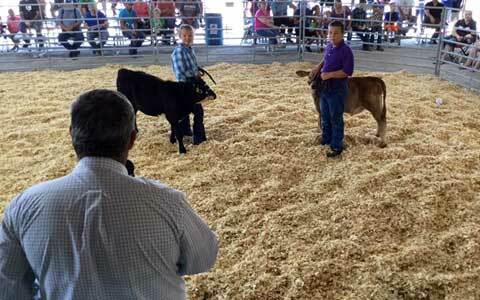 BG, reserve grand champion; Jaiton Bosse, WW, B; Tate Smith, WW, B; Brody Thompson, WW, B; Chloe Cannon, NO, B; John Sand, NO, B.
Angus junior yearling heifer 1/1 – 4/30, previous year: Morgan Woodbury, VBR, B, class champion; Allison Reeser, MJH, B, class reserve champion. Hereford junior yearling heifer 1/1 – 4/30, previous year: Braelyn McNally, MJH, B, class champion. Commercial summer yearling heifer, 5/1 – 8/31, previous year: Dalton Hook, VBR, B, class champion. Senior beef showmanship: Morgan Woodbury, VBR, Grand champion; Ainsley Corwine, WW, reserve grand champion; Peyton Pearson, WW, B; Jamison Corwine, NO, B; Dalton Hook, VBR, B: Gabe Butel, NO, R.
Intermediate beef showmanship: Grace Croucher, WW, Grand champion; Josie Thompson, reserve grand champion; Ethan Kneisler, LL, B; Owen Tomlinson, NO, R.
Junior beef showmanship: Braelyn McNally, MJH, Grand champion; Allie Kneisler, LL, reserve grand champion; Allison Reeser, MJH, B. Grand champion market beef: Peyton Pearson, WW. reserve grand champion Market Beef: Grace Croucher, WW. Angus market steers: Allie Kneisler,LL, class champion; Ethan Kneisler, LL, reserve class champion; Hayli Roettgen, BG, B; Riley Rickel, BG, R; Cody Atchison, BG, R.
Hereford market steers: Braelyn McNally, MJH, class champion. Maine Anjou market steers: Jamison Corwine, NO, class champion. Chianina market steers: Peyton Pearson, WW, class champion. All other breeds market steers: Gabe Butel, class champion; Josie Thompson, WW, R.
Commercial market steers: Grace Croucher, class champion; Ainsley Corwine, reserve class champion; Owen Tomlinson, NO, B. Dog obedience: Madelyn Montgomery, NO, Grand champion. Dog showmanship: Madelyn Montgomery, NO, Grand champion, Senior. Shane Miles, BG, B. Open class pets: Wylie Young, NO, grand champion. Adult male, over 1 year: Lynnea Nelson, NO, P.
Decorated cat cage: Lynnea Nelson, NO, P.
Grand champion poultry: Madelyn Montgomery, VBR. reserve grand champion Poultry: Kilene Tate, WW. Standard breed, Large Fowl, old: Madelyn Montgomery, VBR, B; Kilene Tate, WW, R.
Standard breeds, Bantam, young: Kilene Tate, WW; B; Kilene Tate, WW, B; Kilene Tate, WW, B; Kilene Tate, WW, R.
Standard breeds, Bantam, old: Madelyn Montgomery, VBR, B; Madelyn Montgomery, VBR, B. Key to 4-H clubs: BG – Burlingame; CW – Clover Wranglers; LL-Lyndon Leaders; MJH-Melvern Junior Highline; NO-North Osage; VBR-Vassar Blue Ribbon; WW-Willing Workers. Key to ribbon placings: P-purple ribbon; B – blue ribbon; R-red ribbon; W-white ribbon; G-green participant ribbon. 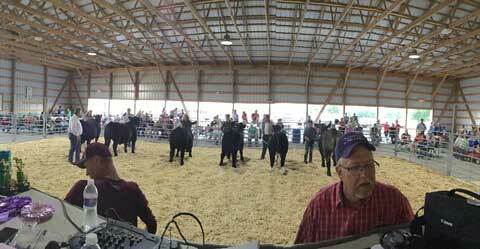 The announcer’s view of the livestock show. Young showmen and their bucket calves undergo examination by the judge. Information thanks to Sally Wilk and the Osage County Fair Association. Photos thanks to Frontier Extension District.